Worried about the rain? – Don’t worry, be happy! Whilst rain is an inconvenience on your wedding day it is certainly not the catastrophe many might imagine it would be. Whilst the weather patterns in Perth were probably the most consistent for a capital city in Australia for many years, the last two years have been anything but normal rain-wise. 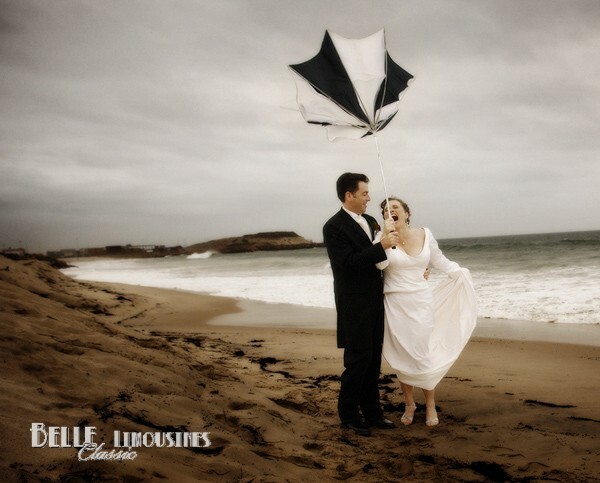 The umbrellas in our wedding limousines have been getting some very unseasonal work outs. 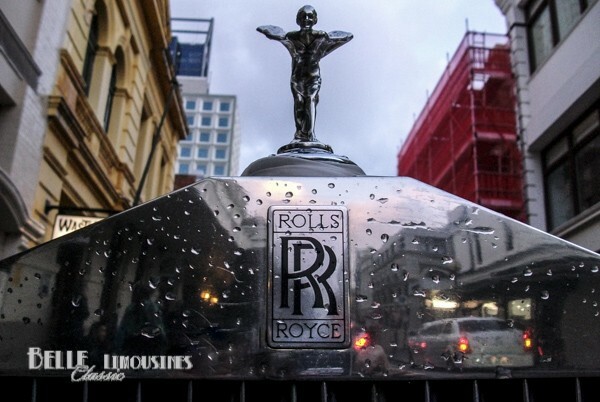 Chrysler limousines have 3 umbrellas, the Rolls Royce limos, REO SpeedWagon limousine and Jaguar Mk5 limousine each have 2 umbrellas and the classic wedding cars also have two umbrellas. From my perspective assisting with hundreds of weddings every year I can confidently say that most wedding days in Perth have predominately fine weather. There are about 150 possible wedding days each year (Friday, Saturday and Sunday for 50 weeks). The trend over the last few years is toward more unpredictable weather. The weather cycle in Perth is often weekly – some years the rainy patches cycle through mid-week so we get a run of perfect weekends. Occasionally the pattern reverses and we get a string of wet weekends. We know that the majority of rainfall occurs in July and August, but for the last two years there have been a few days of unpredictable rainfall each month. As noted above, these days do not always fall across a weekend so most weddings experience fine conditions. On most ‘rainy days’ in Perth the rain clouds move across the city in fronts so there is a twenty – thirty minute period when it is overcast with light rain followed by an hour or two of often cloudy but OK weather. The chance of rain during the 30 – 45 minutes of a garden wedding ceremony which may require a change of location is quite low really. If there is heavy rain forecast you will find that the wedding industry providers will be quite flexible to making last minute adjustments to accommodate the weather. 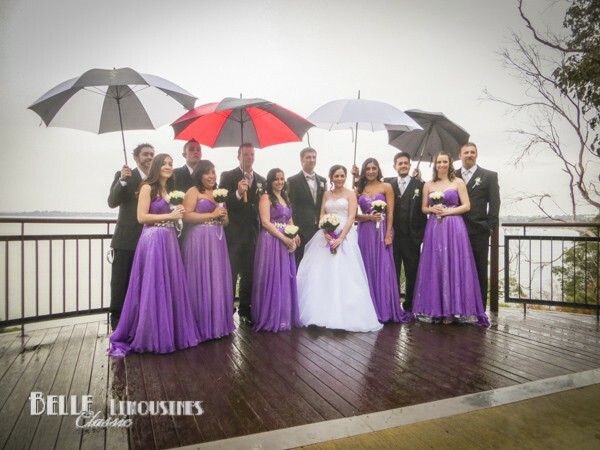 A few simple planning contingencies can take the worry out of a rainy wedding day. With so much invested in the date and the occasion, if fate throws you a special day be prepared, put your plan into action and let the day unfold as it will. Remember to have a laugh and enjoy it along the way. What is the alternative? Plan for a rainy day wedding – what would you do differently if you were expecting some showers on the day? One of the most common changes on a rainy day is that the flow of traffic is much slower and congestion and hold-ups on the road become more frequent. When you are booking your wedding transport plan for a rainy day (which will also work in your favour if there is unexpected roadworks or a cycling event on the day of your wedding). An extra 30 minutes in your wedding transport schedule costs between $60-90. In some cases we may book a following or earlier charter for your wedding cars and may not have the flexibility to adjust your schedule close to the date. This is also important to consider with Perth’s increasing road congestion. On any given day it may take 45 minutes to make a journey which is usually a 30 minute trip. This is especially important for loop-de-loop weddings when the same limousine is delivering the groom’s party before returning for the bride. Delays on the road compound with each trip and the bride’s arrival may be significantly late. Where is the nearest or most convenient undercover alternative location we can move to if it is raining on the day? Kings Park has several covered gazebos, as do many other parks. Hire an inexpensive location with a gazebo near where you are planning your wedding and have a plan for informing your suppliers and guests prior to the wedding. If you are having your ceremony and reception at a one location venue like Caversham House in the Swan Valley you may find that you can shift you ceremony into the reception area or an adjacent undercover area. Ask the questions and plan around what is available. Order a marquee in advance. It will be far less stressful to pay for a marquee you don’t use on a sunny day than to find you can’t organise one two or three days before your wedding when you get a wet weather forecast. Make two schedules for the day – the one you are planning for and a rainy day schedule in the unlikely event of unexpected weather on your big day. Most experienced photographers will know many locations around your area where they can move to if the weather is raining during the photography sessions. Let them direct you. 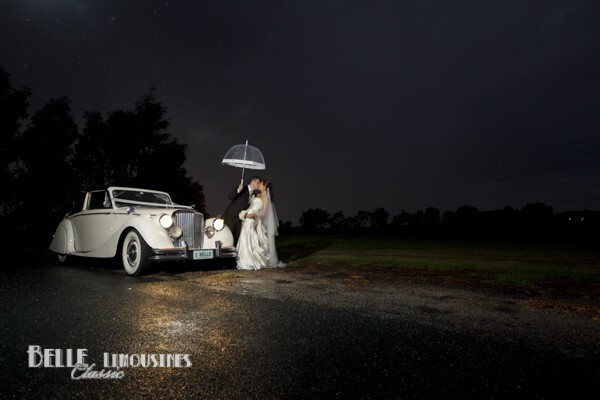 Belle Classic Limousines provides two umbrellas in all of their classic wedding cars and three umbrellas in Chrysler limousines. Expect your guests will look after themselves but it can be useful for parents to bring a few extra for guests who don’t have an umbrella on a rainy day. When ever possible we supply black and white umbrellas which provide a neutral but bright tone to any wedding photographs they appear in. Occasionally the supply of our preferred umbrellas changes due to changes in fashion or high demand. Umbrellas are certainly harder to find in summer months. Check and follow the forecast for your wedding a week in advance. If the style of umbrella that may be used is going to be an issue for you, or you prefer a particular type or colour, identify a supplier who carries several in stock weeks before your wedding to avoid a panic a few days before your wedding. This is the most difficult contingency to plan for. For peace-of-mind discuss the possibilities with your caterers and hire marquees to house the wedding or a nearby hall that you are happy to move to if the weather does not permit your original plan to proceed. Make a list of all your wedding suppliers with their out of office and office contact numbers. It saves a lot of anxiety having contact numbers available if unexpected changes need to be made on the day. Make a list of all your wedding guests with their mobile contact numbers (for an urgent change of location call) as well as their usual home or work numbers. File a couple of copies that can be given to a few friends or members of the family to ring and adjust the day’s schedule to your rainy day alternative. If it looking like Plan B might be needed, forewarn your telephone crew of the job they may be needed for on your wedding day so they can be prepared if it eventuates. 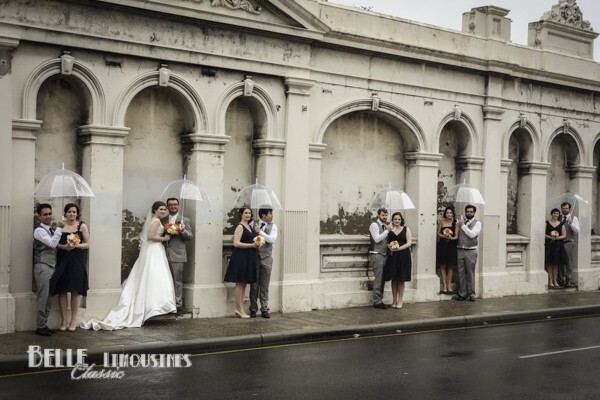 It may surprise you how interesting some of the wet weather wedding photography turn out. Some of the pictures do not appear to be overcast but were taken on raining wedding days. Such is the nature of a rainy day in Perth. Enjoy the following images as you plan for your day. 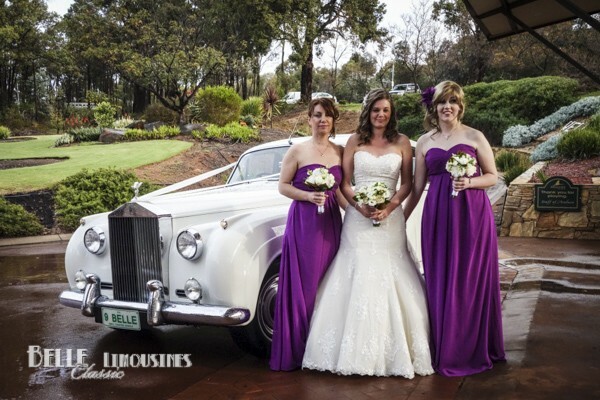 Belle Limousines offer obligation free advice all all aspects of wedding car hire. Email your inquiry or phone the office on 9279 9922 to discuss your wedding day and transport requirements. 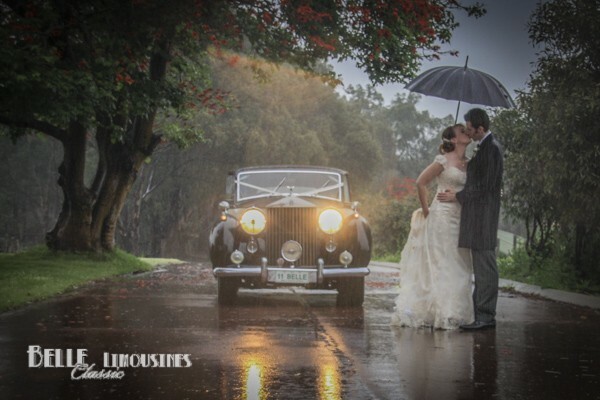 We are experts on the various Perth wedding venues and can offer suggestions for local facilities and photo locations that may be useful in the event of rain.